I have been flirting with the idea of spiritual disciplines for quite some time. There is something about spiritual disciplines that tugs at my soul and draws me down into its depths. There is also something about “the doctrine of instant gratification” that, in much the same way, tugs at my soul and draws me into the ease of its shallow waters. I am constantly drifting between the shallow and the deep. Some days, I splash around in the shallow. It’s easy. The sun is on my back. Facebook is on my phone. If my brain gets too quiet a friend is just a text away. A quick fix. An easy fix. An empty fix. Some days, I venture into the deep. It’s not easy. The water down deep is chilly. Complex texts need to be digested. People need to be heard. There is no fix. But I feel whole. My tendency is to skirt the edge of the deep. I dip in a toe. I read a book. Or part of a book. I might even blog about my quest. And then I get chilled in the depths. Or maybe the newness wears off. Or maybe I get overwhelmed. This year’s opportunity: to take part in the exciting opportunity to write about practicing spiritual disciplines with my family on this blog. Some days, I don’t even pray with my kids. Most days, I mess up with my kids. Besides, this is the opportunity I have always known would happen: I am going to be exposed as a fraud. I’m a total mess, really and truly. But as I have done before, I welcome you to my mess. I’m not sure what this mess of practicing spiritual disciplines is going to look like, exactly. 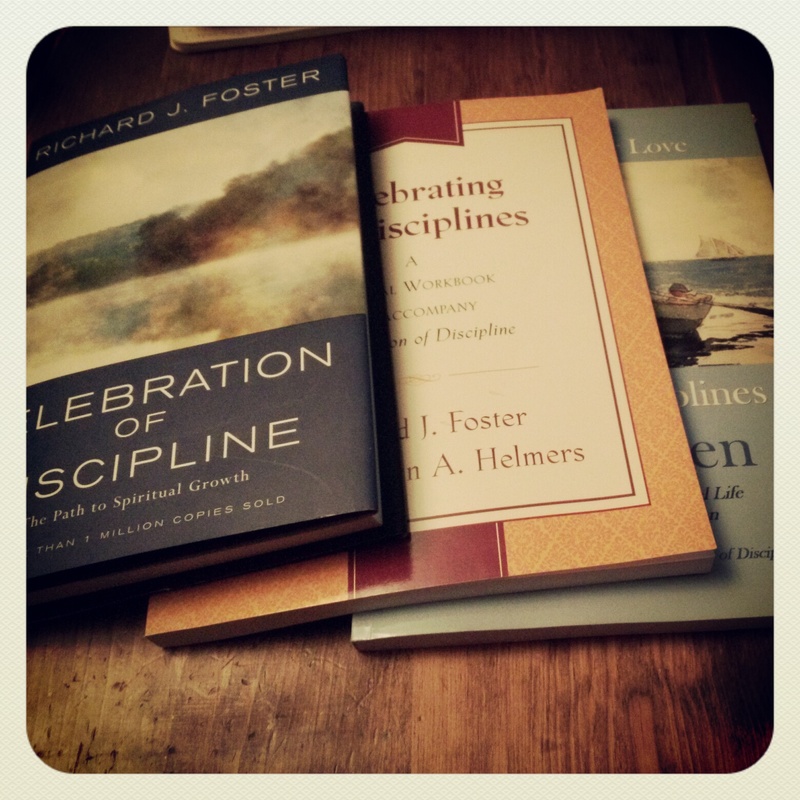 I am reading Celebration of Discipline by Richard Foster and Celebrating the Disciplines: A Journal Workbook to Accompany Celebration of Discipline by Richard Foster and Kathryn Helmers and Spiritual Disciplines for Children by Vernie Schorr Love. I may use the guidelines in Celebrating the Disciplines and make this a methodical, yearlong venture. Or I might veer off the course of a book and write about my wanderings. I don’t know yet. I just know that I am excited. I am diving into the deep.